Abstract: Kistler Aerospace Corporation (KAC) is a privately financed company designing, building, testing, and operating a fleet of fully reusable rocketships. The K-0 is currently in development and flight testing in Mojave, California. The K-0 will prove several commercial concepts for use in later Kistler vehicles. The K-l system is under development for a 1998 launch and should be capable of flying at least 300 such missions. The K-l will be followed by larger and more capable vehicles like the K-2 and K-3 that will be able to eventually place 20,000 pounds into LEO. The commercial approach is a series of progressively larger rocketships each building on what is learned from the first, and the use of exiting and emerging government technology in the single stage to orbit environment. KAC believes that the development of a fully reusable vehicle with airline style operations will reduce the cost of orbital transportation by one to three orders of magnitude. Walt Kistler is using a specific set of Design Guidelines evolved from his over 50 patents and 50 years in the entrepreneurial business. Fully capable, reusable K-3 vehicles based on the emciging technologies are over a decade away from reality. Abstract: Full exploitation of space demands a reliable, low-cost launch system. Of the many such systems proposed, the most practical is the magnetic levitation catapult launcher, or MagLifter. Current research in high-speed trains, an electromagnetically-driven Air Force test sled, and energy storage systems, all using high-temperature superconductivity, create a technology base on which to build MagLifter. The operational system would accelerate a vehicle up a mountain tunnel to 600+ mph before launch. This would greatly increase launch efficiency of expendable or reusable rocket-powered vehicles and lower payload-to-orbit costs by an order of magnitude from today. Serious work in MagLifter-related technology is being pursued by NASA, the Air Force, and industry. A Colorado state agency is integrating all these programs to move forward on building MagLifter. Abstract: A mass launch concept, called a slingatron, is described in which a coriolis wave can be used to slowly accelerate a magnetically levitated projectile around a circular path in a long guide tube. The guide tube is evacuated and cryogenically cooled using LN2 so that the projectile circles around the accelerator with a very small EM friction coefficient decreasing as velocity V-1/2. The tube structure is simple, contains no coils, and has a liner of normal conductivity material. The slingatron appears capable of smoothly accelerating masses ranging from small values to tons to velocities ranging to above 10 km/s and possibly to above 30 km/s. It has the potential for cumulatively launching enormous amounts of mass into earth orbit or interplanetary space at relatively low cost without atmospheric pollution. A specific example is discussed in which projectiles of mass 25 tons are launched at 8 km/s into earth orbit, with final orbit insertion being accomplished with a small rocket kick at apogee. Innovatively structured payloads able to tolerate the typical perpendicular accelerations of ~103 gees could also be launched. Abstract: The objective of this research was to exploit wireless power transmission (microwave/millimeter) — to lower manned space transportation costs by two or three orders of magnitude. Concepts have been developed for lightweight, mass-producible, beam-propelled aerospacecraft called Lightcraft. The vehicles are designed for a “mass-poor, energy-rich” (i.e., hyper-energetic) flight infrastructure which utilizes remote microwave power stations to build an energy-beam highway to space. Although growth in laser power levels has lagged behind expectations, microwave and millimeter-wave source technology now exists for rapid scaling to the megawatt and gigawatt time-average power levels. The design exercise focused on the engine, structure, and receptive optics requirements for a 15 meter diameter, 5 person Earth-to-moon aerospacecraft. Key elements in the airbreathing accelerator propulsion system are: a) a “flight-weight” 35GHz rectenna electric powerplant, b) microwave-induced “Air Spike” and perimeter air-plasma generators, and c) MagnetoHydroDynamic-Fanjet (or MHD-Fanjet) engine with its super-conducting magnets and external electrodes. Abstract: It is proposed here that a technology be developed to build space modules which have a dual purpose, that of being both a prefabricated habitat segment and also temporarily being their own fuel tank during launch. Concurrently a re-useable unmanned winged engine control tug vehicle would be developed for the-wet-launch of these modules, along with an additional flyback booster. This would provide a way to build economically a large diameter artificial gravity space habitat in LEO in which the majority of its structure would be built and emplaced prior to the first human presence there, reducing risk and cost. The toroidal space habitat would be built and assembled first on the ground in the form of the dual purpose modules, checked out, then dissassembled and launched a segment at a time to the orbital site. Such wet launch enables the tank and launch vehicle structural mass to actually be part of the payload. Abstract: The goal is to develop an electromagnetic launcher for crewless, reusable vehicles, launched at velocities of Mach 2-5 (to Mach 9 if special lasers cause partial vacuum-paths). Means studied for achieving the goal are: (1) Perfectly streamlined launch vehicle (LV) not exceeding diameter of 2m; (2) Two vehicle coils (VC) carried in LV for return to launch site, rather than by separate carrier on a track at launch; (3) Eighteen guided lasers spaced 20° apart around outer circumference of launch tube’s upper end, kept aimed just ahead of LV for 25km after launch; (4) A special laser in LV’s nose, aimed dead ahead; (5) A heat shielded, cone shaped nose; (6) Chemical rockets to boost the LV into LEO after the coast period, when the LV is 25-50km high. Theory indicates that laser beams resonant to synchrotron wavelengths of nitrogen/oxygen, may ionize/heat these air molecules almost instantly if transmitted with certain features. Discussed are both vertical landing SSTO LVs, and horizontal landing LVs with flight gear extended in LEO. 400-1600 pull coils are required in the launch tube, the number depending upon superconduction developments. Launch will probably be directed up the west slope of an extinct volcano such as Mauna Kea in Hawaii. Abstract: The idea of turning threatening asteroids into useful products to prevent them from colliding with Earth has been reinforced by recent analysis of the tremendous profit potential of their precious metals. “Consumption” is a third major option for preventing asteroid disasters. The other options are to use nuclear weapons (“clobber”) or to gradually propel (“coax”) the threatening body into a slightly different orbit. Our objective is to put the asteroid threat, it’s potential solutions and space resources into a clear perspective. Even the better solutions have some uncertainty; and none seems universally applicable. Our most urgent recommendation is to robotically explore every type of near earth object (NEO). 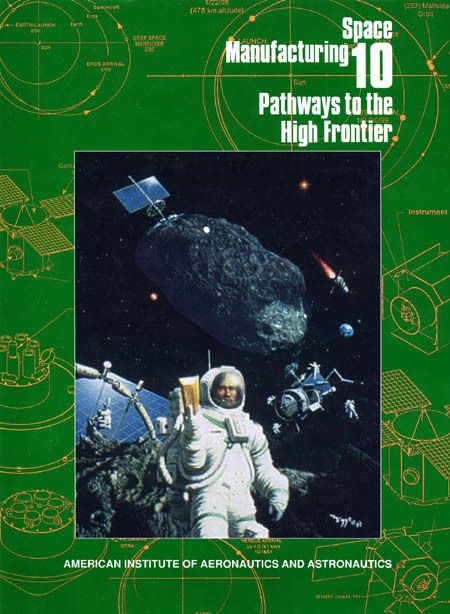 Based on our current limited knowledge, however, we believe that: (1) nuclear weapons approaches entail an unacceptable risk of compounding the threat; (2) propulsive remedies must often use extraterrestrial materials as propellant; (3) propulsive remedies must be applied carefully to deal with spinning and fracturing the asteroids; (4) consumptive remedies may not be well motivated by profits; (5) consumptive remedies beg the question of propulsive deflection; and (6) space resources may play their biggest role in providing the infrastructure for an asteroid protection. For now, we strongly lean towards “coaxing” threatening objects off harm’s path. Abstract: The Near Earth Asteroid Rendezvous (NEAR) mission will be the first to achieve orbit around an object as small as an asteroid. It will launch in February 1996 after a 27 month development program that will cost about $120 million. NEAR will orbit the unusually large and important near-Earth asteroid 433 Eros for about one year and will make the first comprehensive scientific studies of a near-Earth object. This paper will present an overview of the NEAR mission, spacecraft, and instruments, focusing on how a small satellite design approach can be used to achieve first rate science return from a low cost, quick turnaround planetary mission. Abstract: The Near Earth Asteroid Returned Sample (NEARS) mission objectives are to obtain up to six bulk samples, up to 100 grams each, from a near-Earth asteroid, and to return the samples to Earth for laboratory analysis. A sample return would permit the full range of laboratory methods to be applied to petrological, chemical, age, and isotopic analyses. The mission design allows for the NEARS spacecraft to be derived from that for the Near Earth Asteroid Rendezvous (NEAR) mission, which is currently under development at the Applied Physics Laboratory (APL) of the Johns Hopkins University. The remote sensing instrument suite on NEAR will be replaced by a re-entry capsule designed by Lockheed-Martin Marietta. The capsule will contain a pyrotechnic sampling device designed by APL. Sampling operations will use a “touch and go” strategy, requiring only momentary (less than one second duration) contact with the asteroid surface. After departure from the asteroid, the spacecraft will return to Earth. The capsule will separate from the spacecraft, re-enter the atmosphere, and descend on a parachute to Earth’s surface for land recovery. Preliminary studies demonstrated several potential advantages from advanced arcjet application, including increased spacecraft mass margin, increased stay time, and a simpler propulsion system design. Abstract: Indigenous lunar materials are almost exclusively oxides, mostly occurring as complex silicates. To extract metals from these materials, it is advantageous to separate the oxides. A promising approach involves their selective evaporation, benefitting from the lunar vacuum and the available solar energy. In recent work sponsored by SSI, we examined the evaporation of silicon dioxide from anorthite, CaSi2Al2O8, with the goal to prepare calcium aluminate as a starting material for the electrolytic extraction of aluminum metal. Earlier work, supported by NASA, targeted the separation of iron oxide for the production of oxygen. A high-vacuum bell jar system was used for the experimental studies. Oxide (silicate) samples were placed on a heating strip and exposed to a high vacuum of 5 x 10-5 to 5 x 10-6 torr, then the temperature increased to 1200 to 2000 °C. Part of the evaporating material was recondensed on a metallic collector foil, to be analyzed. Using oxide mixtures and single-crystal anorthite, silicon oxide indeed volatilized in essence quantitatively at temperatures of 1500 °C and higher. Some calcium and aluminum was also found in the condensate. It appears that the approach could be developed into a process to prepare a suitable, reasonably pure raw material for the production of aluminum metal. Selective iron oxide evaporation from MLS-1 samples could be observed at appropriate conditions. At a vacuum of 2 x 10-6 torr, iron oxide completely volatilized at 1200 °C. At higher temperatures, magnesium oxide and silica also vaporized. Selective evaporation of iron oxide could be exploited for the production of oxygen and electrolytic iron. Abstract: The primary thrust of this paper is exploitation of water resources and secondarily exploration. The targets are earth approaching comets and earth approaching carbonaceous chondritic asteroids. Water production is to be via wells drilled through the regolith into rock containing combined and/or inter-stitial water ice. The holes are to be drilled using down the hole hammer drills. The gaseous drilling fluid for powering the drill and flushing the cuttings from the hole is excess hydrogen propellant and volatile products from the drilling. Power is solar-thermal so the drilling and production should be as near the sun as possible, at perihelion. Rendezvous at perihelion requires about 1 1/2 times the delta-V required at aphelion. Two reasons for rendezvous at perihelion are the proximity to the sun for solar thermal power and interest on the capital investment. Rendezvous at aphelion may require more than seven years for a round trip as opposed to around two to three years for rendezvous at perihelion. The market is in LEO and cis-Lunar orbit for propellant, life support and chemical processing media. Much telescopic spectral data in the ultra-violet, visible and infra-red is needed to classify the NEAs. At present this data is very meager. Abstract: SSI has joined with other organizations in endorsing an AIAA position paper to the U.S. Congress on responding to the potential threat of an NEO impact on Earth. Even during the past two decades, since the writing of The High Frontier, our understanding of the evolutionary nature of the solar system and the cause of the dinosaurs’ extinction has increased dramatically. Although many engineering and management challenges lie ahead, it is likely that the discovery rate of asteroids and comets will be accelerated at least ten-fold in order to warn humanity of impending impacts and provide time to mitigate the risk. A very beneficial side effect of this activity to SSI’s mission will be the tremendous surge of new information on our close neighbors which promise far greater material resources than the lunar surface with far less energy required to exploit them. Abstract: While the problem of cutting costs for transport from the surface of the Earth to Low Earth Orbit remains the top priority of attention for the Space Community, the second priority must be human survival over the long term in Space. Two aspects are considered here, the Administrative, the Medical, and their interface. For short-term Space flights and flights in orbit close to the Earth, the military model of command structures has, historically, been found effective. But when long distance flights are contemplated, and when independent, civilian communities in Space are established, the military model may no longer be enough. Indeed it may be dangerous. Using the Inuit umiak as a model, the forms of authority are introduced, the roles played in small groups are described, and the relationship between them and Jungian typology is described. There are reasons to believe that these considerations are fundamental to long-term, human survival in the Universe. It has been shown previously that the Practice of Medicine in Space may offer many new approaches to the treatment of a wide range of common, yet largely intractable, illnesses. Equally it has been suggested that this might have a significant impact on current health care economics. However, in the Space community there seems considerable resistance to the idea, as evidenced by a review of the Proceedings of the Princeton conferences. These are based upon the presumption that would-be Space inhabitants will, of necessity, return to the Earth. If this is not true, then there is no reason to believe that the suggested advantages of Extraterrestrial Medicine may not be confirmed. It only remains to prove, or deny, their reality in practice. Abstract: Previous papers have examined the physical differences between natural and artificial gravity, through mathematical derivation and computer simulation. Taking those differences as given, this paper examines: the role of gravity in architectural design; the extensions of architectural theory necessary to accommodate the peculiarities of artificial gravity; and the appropriateness of space colony architecture as illustrated in the “Stanford Torus”, “Bernal Sphere”, and similar proposals. In terrestrial gravity, there are three principal directions — up, down, and horizontal – and three basic architectural elements – ceiling, floor, and wall. In artificial gravity, due to inertial effects of relative motion in a rotating environment, east and west (prograde and retrograde) emerge as gravitationally distinct. Thus, there are not only three, but at least five principal directions: up, down, east, west, and axial. The grammar of architecture for artificial gravity should accommodate this fact. To be meaningful, architecture should have formal properties that are similar to other aspects of the environment. The goal is not to fool people into thinking they’re still on Earth, but rather, to help them orient themselves to the realities of their rotating environment. Abstract: In the future the demand for space operations is projected to increase dramatically, requiring the development of innovative ways to accomplish work in space. One method under consideration to meet this demand is the use of robotic systems, with capabilities ranging from simple teleoperation to complete autonomy. The Ranger Telerobotic Flight Experiment is designed to demonstrate in the near term the ability of a free flying telerobotic system to perform many required operational tasks including on-orbit refueling, instrumentation package replacement, and deployment of failed mechanisms such as antennae and solar arrays. In addition, this experiment will include the development and operation of a functionally equivalent neutral buoyancy vehicle, to quantify the utility of the neutral buoyancy environment for simulation of on-orbit robotic operations. By combining current robotic technology with a free-flying spacecraft bus, Ranger embodies a new class of highly capable space vehicles that will help meet the demand for future space operations. Abstract: The Kilauea volcano, located on the big island of Hawaii, represents a premier terrestrial analogue for the study of planetary volcanism. Studies of Kilauea have aided planetary scientists in understanding volcanism on the moon, Venus, and Jupiter’s moon Io, as well as the Earth. Because of its geological richness and excellent climate, Kilauea provides the planetary science and rover community with a tremendous natural laboratory in which to experiment with applying roving vehicles to studying planetary geology. Tests conducted at Kilauea in February 1995 represent the first time a state of the art, fully integrated rover chassis, teamed with advanced ground control software, has been placed in the hands of a science team, allowing them to perform remote science in a manner similar to that of an actual planetary mission. The ultimate goal of these 1995 Kilauea tests is to send sophisticated robotic rovers to the moon and Mars to study planetary volcanism. The insight gleamed from this test will allow us to better design the actual rover chassis, along with its associated software, for these upcoming challenges. Abstract: The question of how to navigate is critically important to the success of any lunar rover mission. While humans typically have good judgement about which routes to take, they often get fatigued and disoriented when teleoperating rovers with time delay. On the other hand, while autonomous systems can produce safe and reliable navigation, they tend to be myopic. We are investigating mixed-mode methods of control that combine the strengths of humans and rovers. The rover uses range maps produced by stereo vision and a detailed model of the vehicle to evaluate the traversability of various paths. The evaluations are combined with recommendations from a human operator to produce a commanded steering angle and speed that is both safe and responsive to the operator’s objectives. We have implemented and are testing such a system, using a prototype lunar rover that operates in outdoor, natural terrain. Abstract: The Moon is an accessible planetary body with possible commercial agenda for exploration, manufacturing, and habitation. Carnegie Mellon and LunaCorp have proposed a robotic lunar mission motivated by agenda of exploration and mass participation. This mission is an expected precursor to a series of increasingly capable robotic devices and missions leading to a permanent presence on the Moon. The mission is an expedition to five historic landing sites starting with Apollo 11. Twin rovers launched from a Proton rocket will record geology and visually map the surface during this 1000 km traverse. The general public will have an opportunity to participate through tele-experience, driving and verbal interaction with the rovers. Current design requirements include high quality video, reliability, availability, and interaction capability. The proposed rovers would operate night and day using a Krypton-85 (a beta source) and thermoelectric converters. The rovers relay live panoramic video directly to Earth using an S-band phased array. Sensors like terrain scanners, inertial units, star trackers and encoders are used to safeguard and navigate the machine. Powerful computing hardware and algorithms allow facile interaction and provide support for image processing, compression, safeguarding and navigation. Chair: Steven Vetter, Molecular Manufacturing, Inc.
Abstract: This paper opens a discussion of practical configuration architecture options for first-generation orbital mixed-use business parks. The focus is on pressurized module systems derived from International Space Station systems currently being produced. Commercial development of such derivatives is shown to depend on demonstration of successful Space Station deployment and operations. Module outfitting concepts are described that would support manufacturing, tourism, and crew support functions while minimizing new engineering development. Provision of common infrastructure services is a terrestrial business park practice proposed as also applicable to the orbital business environment. Basic launch requirements to enable business park development are briefly summarized. Marketing issues for near-term orbital business parks, including the need and strategy for pre-sales are reviewed. The paper closes with a review of analogous examples of successful, long-term commercial development of entire new industries based on initial government investment in the requisite path-finding technologies, followed by significant private investment and job growth. Abstract: “Bootstrapping” is the key to starting space settlement: Start with the least expensive manufacturing and transportation system which can use materials in space to increase its own capacity. Some proposals call for a large mining base and refinery on the Lunar surface. But these new technologies allow a different system architecture: Tethers, rotating in orbit, catch raw materials coming from the Lunar surface, recover their kinetic energy, and throw mining equipment back toward Luna. The tethers are fully reusable and do NOT consume propellants! Miniature rovers are used instead of astronauts on the Lunar surface. They only need to sift Lunar regolith and load spacecraft. The mining base shrinks in mass (and cost) to a few 10 kilogram tele-operated rovers with some stationary support equipment. Regolith Rockets use preheated Lunar soil for reaction mass to lift off the surface. A liquid gas is vaporized by the heat of the particles, accelerating them out the rocket nozzle. This low cost transportation allows us to optimize the locations of manufacturing: Initial manufacturing is in LEO where machinery and workers are easier to support. Bulk materials are later refined in high orbit where solar energy is continuously available. The system grows by producing: fiberglass tethers; metals for spacecraft and habitats; solar panels, slag for shielding, and oxygen. Growth may be self financing by selling transportation service, fuel, power, and satellite components – all without the expense of sending people to the Lunar surface. Abstract: The cost of opening the high frontier is very dependent on the cost of transporting the initial mining and manufacturing facilities from the Earth. This cost is closely related to the mass of these facilities. This paper examines what limits are encountered as one tries to shrink the mass of the initial base. Solutions are proposed to break through or work around each limit as it is encountered. Finally, we come to the conclusion that the only real limit is at the molecular level. This leads to the realization that building things from the bottom up, with atomic precision, is not only possible, but highly advantageous to the goal of opening the high frontier. This work is based partly on research in minimizing the mass of a solar power satellite (SPS), lunar-material-intensive SPS designs, robotics, self-replicating systems, and other related areas of technology. This paper assumes no new science, but it is based on some reasonable projections of scientifically-sound technological progress. Abstract: Commercialization of any new technology requires fulfilling three criteria: technical feasibility, functional safety, and market demand. Experts generally agree that using microwave technology in space to generate power is feasible, and most believe it to be safe, although longitudinal exposure data do not yet exist. Where expert consensus breaks down is with regard to market demand, concerning which opinion varies and available data are soft to the point of insignificance. Given the traditional focus of scientific research and development, it is not surprising that marketplace issues command a lesser priority than those of the research lab. However, lack of understanding of market demand creates an insuperable barrier to successful commercialization. The technical community, having satisfied itself of feasibility, must move on: to confirming fundamental safety, and, at the same time, to dealing aggressively with market issues. This paper focuses on the market for power from space as an alternative source of energy. It seeks to raise basic questions and to challenge the technical community to make the leap from theory to practice. Abstract: SABER, an acronym for Semi-Autonomous BEam Rider, is a wireless power transmission demonstration in which an autonomously controlled electric helicopter hovers over a microwave transmitter while obtaining all of its power, and also its attitude and position information from the beam. A rectenna array is mounted on the helicopter’s underside. A rectenna is an integrated antenna, diode, and matching circuit that converts RF power into DC power. A 1 kW transmitter provides power to the helicopter at 2.45 GHz. The rectenna array is a novel three-dimensional design with an approximately 300 W output. Sensors attached to the helicopter provide attitude and position information by measuring the characteristics of the microwave beam. The control system follows a preprogrammed flight schedule to maintains the helicopter over the transmitter. Abstract: The close relationship between the advancements of wireless power transmission technology for high altitude microwave powered platforms in the Earth’s atmosphere and that for the SPS, or Solar Power Satellite, is explored in the context of a current SSI program at MPT Systems and the University of Alaska to demonstrate wireless power transmission with a new transmitter technology that is essential to both of these applications. The transmitter is an ESPAH, acronym for “electronically steerable phased array module”. This module could be replicated in thousand fold quantity and used as the radiating elements in an electronically steerable phased array. The module utilizes new slotted waveguide array technology and a new kind of microwave generator called the MDA, acronym for “magnetron directional amplifier” to maximize the efficiency of such a module and to reduce its cost. The MDA is described and its performance properties illustrated. Abstract: Solar power satellites (SPS’s) have been proposed as a means by which energy from the sun can be collected continuously in geostationary orbit, and transmitted to rectifying antennas (rectennas) on the Earth. Recent advances in thin-film technology may allow for significant reductions in the amount of mass needed to supply a given amount of power. Lightweight flexible substrates can be coated with a thin film of photovoltaic material. Furthermore, if solid-state microwave transmitters can be deposited on the same substrate, then nearly the entire area of the substrate is available to serve as both solar collector and transmitting aperture. Because a larger transmitting aperture emits a less divergent beam, smaller SPS and rectenna areas become possible. If large numbers of thin-film SPS’s are necessary, it may be possible to lower their cost even further by using lunar materials. The combination of a lunar infrastructure and thin-film technology may pave the way toward a lunar power system (LPS) which would involve solar collectors and microwave transmitters on the Moon, and microwave reflectors in low Earth orbit. Other future applications of this technology are solar sail space probes as well as demonstration SPS’s in low Earth orbit. Abstract: This paper is intended to start a discussion on feasible design strategies for a recently proposed solar power satellite (SPS). This SPS is unique in that it takes advantage of advances in solar collecting technology to reduce the total mass of the array and hence the support structure as well. One proposed configuration, called the “bicycle wheel”, will be studied here in detail. It is assumed that the first such SPS will be assembled in low earth orbit and then boosted to its operational geo-synchronous orbit. Given this, a telerobotic assembly of terrestrial fabricated parts is proposed. The SPS consists of a central mast from which prefabricated thin film array wedges are robotically deployed from their rolled up configuration. The exact number of required rolled up wedges depends on launcher geometrical constraints. The tubes about which the arrays are rolled form a higher stiffness rim for the array structure as it is deployed. Guy wires and rotationally induced forces will be used to provide further stability. During assembly it is envisaged that a similarly designed “construction base” with long spars instead of arrays will provide some added stability and mounting locations for the assembly robots. It should also be possible to use the same construction method to build thin film disc shaped solar sails. Abstract: O’Neill’s concept of the High Frontier is based on the successful breakout of the human species from the Earth. Unfortunately, those working to realize this goal are at odds with the existing space establishment. Like it or not, current space activities are dominated by our national government in the form of NASA and various sets of treaties, laws and policies, most based on a cultural model which has none of the characteristics of a frontier oriented endeavor in a democratic free enterprise society. It is time for a new paradigm. It is time for the central organizing goal of U.S. space activities and policies to become opening space to human settlement. This means completely turning our space agency on its head, and has tremendous implications for our entire human space effort. A new set of guiding principles must be adopted if we are to ever open the High Frontier. Called “the Frontier Principles,” they clearly define the style and mission of any government activities in space and the governments’ relationship with the private space sector. Along with the Principles comes “the Frontier Enabling Test,” a litmus test that aids in judging whether any particular technology, policy, law or even private activity is helping us along the critical path or is a waste of time. Using these criteria, the author will lay out a series of policies, ideas and projects (many of which are already underway) that can utterly change our national space agenda, and lead to the opening of the High Frontier in our lifetime. Abstract: The legal and regulatory framework necessary to “normalize” space as a place to conduct industrial and tourism business is explored. This normalization is shown to be a promising path toward self-sustaining and expansionary development of low Earth orbit. Alternative concepts for what constitutes “real estate” in space are presented, with the conclusion that space infrastructure assets are personal, rather than real, property for ownership and tax purposes. Applicable theories of ownership, financing, building codes, property management and regulation are all discussed at length. Specific conclusions are presented in each area regarding how familiar methods could be put into practice in space to facilitate, and in some cases enable significant commercial development. Abstract: This is a proposal to set up a mutual fund primarily to accumulate money for the investors. A side benefit is to open the space frontier by helping companies whose products could be useful in space development. The long term goal is to allow our descendants to emigrate to a space settlement. To allow participation by the general public, all investments must be in registered stocks. This avoids the problems of past funds which were limited to only a few ‘accredited investors’ or were stopped by the US Securities laws. It will start as space investment clubs, with all partners contributing money and approving the investment decisions. Abstract: This paper presents an integrated space business model that makes use of the proposed light mass solar power satellite (SPS) and proposed reusable single-stage-to-orbit (SSTO) technologies. The objectives of this exercise are to: 1) demonstrate that the SPS, SSTO combination can produce mass market quantities of electricity at a competitive price; 2) that the demand for the electricity thus produced is sufficient to make it worth while to develop both the SSTO and SPS technologies and 3) to examine the minimal investment needed to enter the market. Conclusions reached are that the SPS, SSTO combination can indeed produce competitively priced electricity but that such competitively priced electricity depends upon the continued dropping of the price of photovoltaics for terrestrial applications. That while the SSTO, SPS combination is a giant step forward to generating a market that makes the development of a reusable launch technology worth while, the mass requirements for the light mass SPS, as currently envisioned, are still too massive for a first generation SSTO technology. Reusable orbital transfer vehicle (OTV) technology must necessarily be considered in any scheme to exploit the potential of the light mass SPS. Abstract: Environmental issues have been seldom discussed regarding the eventual settlement and development of the moon. This effort outlines the reasons for addressing environmental issues and makes several proposals to foster the development of environmentally-friendly lunar technologies and systems. Abstract: 1995 marks significant activity internationally in Solar Power Satellite development. Key programs include the study efforts currently underway at NASA, ongoing work by industry and academia in Japan and the Wireless Power Transmission ’95 Conference scheduled for Kobe in October. The new NASA program’s emphasis on economic viability is an important advance. Demonstrations by university and industry teams are providing visibility and opportunities for knowledge transfer to a new generation of engineers. The Clementine lunar mapping efforts may prove to be of critical importance to the construction of SPS from nonterrestrial materials. However, research into the concept of bootstrapping and scaling of partially self-replicating systems needs to be advanced. Abstract: It is shown that there exists a pair of aperture illumination functions for a phased array antenna which yield antenna energy patterns whose main lobes are similar, but whose sidelobes are different. By switching between these patterns, a power beam can carry information in its sidelobes, while leaving the main lobe substantially unaffected. In addition, these patterns can be combined to cancel the main lobe and put the energy into the sidelobes. The energy distribution thus has a minimum at boresight and reaches an azimuthally symmetric maximum off boresight. Such a “hollow” energy distribution can be applied to uses in wireless power transmission and communication. Abstract: Simple considerations make it clear that equatorial launch sites can offer a contribution to lowering the costs of lifting payloads into Earth orbit. Of all such sites only Ecuador can offer the combination of factors which can allow such a set of advantages over both short- and long-term periods. The short term advantages include a healthy, well managed economy, stable and benign government, and a good transportation infrastructure. The peninsula lying between Pedernales and Cojimies, enclosing a large natural harbour, offers the development of a freeport able to support a boot-strapping Space programme without government involvement. In the long term, the region surrounding the extinct volcano Cayambe offers the development of advanced, low-cost launch systems.